Seasonal forecast from the NOAA Climate Prediction Center. How to read the seasonal forecast maps? Total Precipitation for the Next 2 Days (48 Hours). You may want to take a look on our forecast tool. The Mission of the UF/IFAS AgroClimate group is to develop knowledge in agrometeorology/agroclimatology and transfer that knowledge to help agricultural managers mitigate production risks associated with climate variability and change. Agricultural production is always subjected to risk associated with climate variability. AgroClimate tools can help producers reduce production risk and increase productivity. Plan your crop season based on phenological stages date ranges with extreme weather events probabilities. Accumulated daily maximum temperature above the thresholds of 82ºF, 86ºF, 90ºF, 93ºF or 97ºF. Producers can monitor weather conditions, register fields and track weather patterns during crop development stages from planting to harvest. Monitoring of rainfall, air temperature, growing degree days, chill hours and extreme weather events and forecasting of weather conditions in your field. 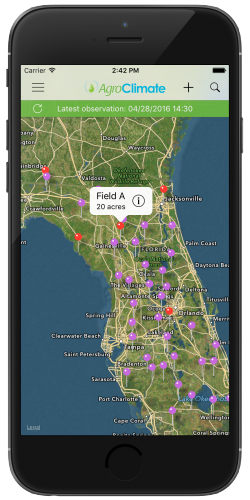 Manage your crop seasons tracking weather information based on commodity, planting/start date, soil texture and irrigation management. Forecast and monitoring of development stages for main crops including corn, soybean, cotton and wheat. Strawberry growers can receive alerts for Botrytis and Anthracnose fruit rot to better schedule fungicide applications reducing costs by spraying only when necessary. 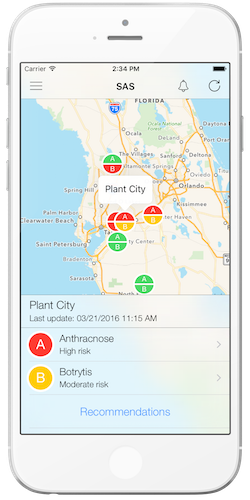 Disease risk alert notifications based on observed and forecast weather conditions. Spray recommendations based on disease risk level and previous applications. Check them all in our Google and Apple store pages.